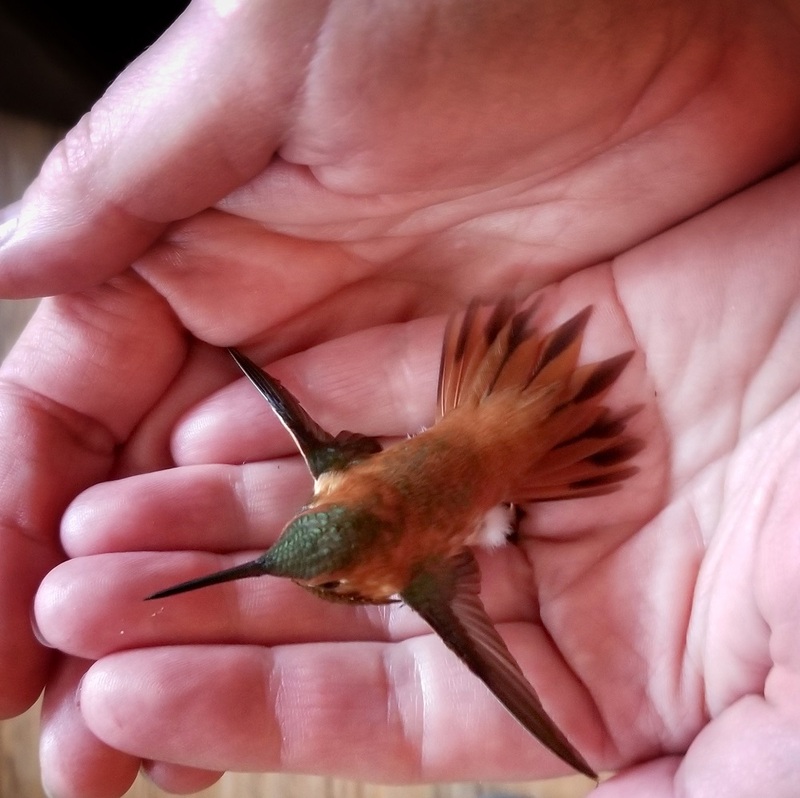 HW rescued him from our deck where he’d fallen after crashing, apparently face first, into the window glass. 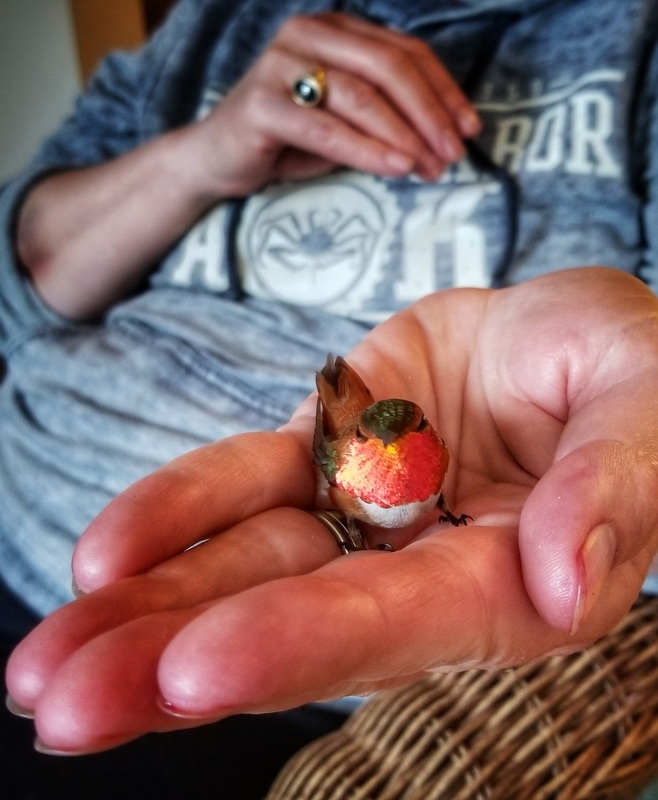 This was at our Nest in Seward, specifically, Lowell Point, a known hangout popular with migratory hummingbirds (“hummers”) in Spring. I’m no expert, but supposedly the males are more colorful. Although identifying the winky on a humming bird to confirm gender is, as you might imagine, challenging. HW makes her own nectar to fill the feeder that hangs above the deck. It’s nothing more than sugar water, aka simple syrup, a common ingredient in cocktails. I postulated that perhaps a bit of gin may have made it into this batch, leading our bitsy hummer to Fly Under the Influence? More likely the window glass had just been cleaned. Poor guy, high on a sugar rush he probably mistook our living room for open air. Limp and motionless on the deck I figured him for dead, but sure enough HW succored him back to health. In the cradle of her hands his tiny wings eventually began buzzing a hundred times a second. She took him back outside and put him on the feeder, where he was able to hold on. Back inside we both watched, fingers crossed. It wasn’t long before another hummer showed up and perched on the feeder, not to feed, evidently, but if you’ll permit me to anthropomorphize, to show concern for what HW believed was her mate. After a half minute or so both hummers suddenly lifted off their perches, swooped down below the window, and were gone. Was he going to make it after all!? Did we perturb the natural order of things, violate the ethos that says we, qua humans, may observe nature but ought never to interfere with it? As I finished my martini I wondered, watched one hummer after another drain the nectar from the feeder, eventually gaining confidence that HW had done the right thing. So what if we altered the state of the universe. Have you never killed a mosquito? Besides, who will ever know? 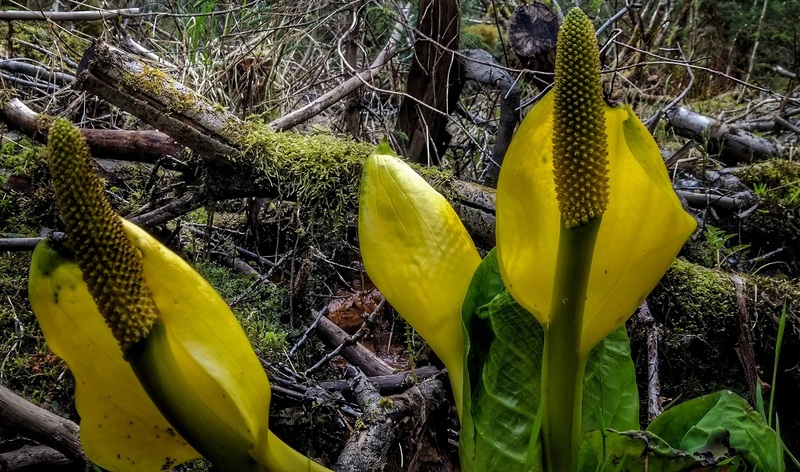 A clearly vital specimen of Western Skunk Cabbage, aka Swamp Lantern, aka Lysichiton americanus. The thing I find most interesting about this plant is how sparse it is. We spot two, maybe three specimens along the entire two to three mile trail, where you’d expect many more given the ideal conditions supporting its growth. Supposedly, after hibernating, bears eat the roots for its laxative properties. Makes sense. I can imagine myself after sleeping five months straight wanting to take a good dump first thing after getting up. We’re tripping back down to the Nest this weekend with friends. Weather is predicted to be fair! Alas, I will face a Honey-Do list that includes the installation of a new countertop/sink and replacement of a water valve on one of our (three) tankless — I call ’em thank-less — water heaters. ADAPT Conference, 2011, Washington D.C.